In this post we will look at a Standard Commands for Programmable Instruments (SCPI) example for controlling Agilent's 34970A / 34972A DAQ / Switch Units remotely. In the example we will remotely monitor a channel and then setup and execute a scan. From there we will look at controlling the 34972A via its built-in web interface and how the web interface can be used as a SCPI programming tool for building a custom program. In the following example a pseudo programming language is used around the SCPI examples. In our pseudo programming language "//' represents comments that will be used to explain what is happening in the demo as we go. The connect() function will be used to connect to the 34970A / 34972A (in our example we will be using a 34972A with LAN, but they each use the same SCPI language). The printf() function will be used to send a command to the 34972A. The query() function will be used to send a command and read back the response from the 34972A. The "data:" will be used to print out the response from the instrument. The SCPI commands will be handled as strings so they will be placed in quotation marks "". A newline "\n" character will be used after each command, depending on the programming language and driver you are using in your program this may or may not be needed. In the following example we will monitor temperature measurement using a thermocouple J-type sensor. Next will execute a multiple channel. The 34970A and the 34972A, for the most part, offer the same functionality and measurement capability. The main differences come from the remote IO. The 34970A offers GPIB and RS232 connectivity and the 34972A offers LAN and USB connectivity. The 34972A also offers a built-in web interface that can be accessed via the LAN connection. All you need is a LAN connection and a web browser to access the 34972A's web interface. The web interface allows you to control the 34972A remotely and offers tools that help you create custom software for controlling the 34972A remotely. A 34972A was connected to the same local LAN network that my PC was connected to. I obtained the 34972A's IP address from its front panel. I entered the IP address in the address bar of the web browser on my PC and I was able to connect to the 34972A's web interface. The below figure shows the web interface control page for the 34901A card in slot 1 of the 34972A. From this page I can close switches, monitor a channel, and create scans. By selecting the "Utility..." button in, the SCPI programming tools can be accessed. As an example, the "Command Monitor" function in the Utility menu provides a list of SCPI commands that coincides with the settings and functionality that were implemented via the web interface. This allows you to mimic on the web interface what you plan to do in your software and then simply cut and paste the resulting commands from the Command Monitor into your program. The below figure shows the Command Monitor window with recorded commands that show a relay being opened and closed continuously, a channel being setup for monitoring, and the monitor reading being fetched from the 34972A. In this blog post we looked at some examples of how to remotely control the 34970A and 34972A using SCPI. We then looked at the LAN web interface on the 34972A and how it can be used as a tool for creating custom software based on SCPI. As always if you have anything to add use the comments section below and if you have any questions feel free to email me. In this two part post we will look at reducing measurement errors with proper cabling and grounding methods. The principles covered in this post can be applied to basic measurement setups, DAQ systems, and automated test systems. A wide variety of general-purpose and custom cables are available. The following factors influence the type of cable that you choose. Signal Requirements – such as voltage, frequency, accuracy, and measurement speed. Interconnection Requirements – such as wire sizes, cable lengths, and cable routing. Maintenance Requirements – such as intermediate connectors, cable terminations, strain relief, cable lengths, and cable routing. Cables are specified in a variety of ways. Be sure to check the following specifications for the cable type you intend to use. Nominal Impedance (insulation resistance) – Found on cables that are intended for frequencies above DC. It varies with the frequency of the input signal. Check for HI-to-LO, channel-to-channel, and HI- or LO-to-shield. High frequency RF applications have exact requirements for cable impedance. Dielectric Withstand Voltage – Must be high enough for your application. Warning: To prevent electrical shock or equipment damage, insulate all channels to the highest potential in the system. It is recommended that you use wire with 600 V rated insulation. Cable Resistance – Varies with wire gauge size and cable length. Use the largest gauge wire possible and try to keep the cable lengths as short as possible to minimize the cable resistance. The following table lists typical cable resistance for copper wire of several gauge sizes (the temperature coefficient for copper wire is 0.35% per °C). Using the sense lines on instruments such as DMMs and performance power supply can compensate for cable resistance. One purpose of grounding is to avoid ground loops and minimize noise. Most systems should have at least three separate ground returns. One ground for signals. You may also want to provide separate signal grounds between high-level signals, low-level signals, and digital signals. A second ground is used for noisy hardware such as relays, motors, and high-power equipment. A third ground is used for chassis, racks, and cabinets. The AC power ground should generally be connected to this third ground. In general, for frequencies below 1 MHz or for low-level signals, use single-point grounding (see below). Parallel grounding is superior but is also more expensive and more difficult to wire. If single-point grounding is adequate, the most critical points (those with the lowest levels and/or the most precise measurement requirements) should be positioned near the primary ground point. For frequencies above 10 MHz, use the separate grounding system. For signals between 1 MHz and 10 MHz, you can use a single-point system if the longest ground return path is kept to less than 1/20 of a wavelength. In all cases, return-path resistance and inductance should be minimized. Shielding against noise must address both capacitive (electrical) and inductive (magnetic) coupling. The addition of a grounded shield around the conductor is highly effective against capacitive coupling. In switching networks, this shielding often takes the form of coaxial cables and connectors. For frequencies above 100 MHz, double-shielded coaxial cable is recommended to maximize shielding effectiveness. Reducing loop area is the most effective method to shield against magnetic coupling. Below a few hundred kilohertz, twisted pairs may be used against magnetic coupling. Use shielded twisted pair for immunity from magnetic and capacitive pickup. For maximum protection below 1 MHz, make sure that the shield is not one of the signal conductors. Signals whose levels exceed a 20-to-1 ratio should be physically separated as much as possible. The entire signal path should be examined including cabling and adjacent connections. All unused lines should be grounded (or tied to LO) and placed between sensitive signal paths. In DAQ systems or ATE system when making your wiring connections to screw terminals on a connection interface, be sure to wire like functions on adjacent channels. Stay tuned for part two next week. And as always if you have anything to add use the comments section below and if you have any questions feel free to email me. In this post we will look at two modulation capabilities found in some two channel waveform generators that we shall refer to as "Double Modulation" (DM) and "Triple Modulation" (TM). DM and TM give you the ability to create some complex waveforms that are not possible with a single channel generator or, in some cases, with an arbitrary waveform created in external software. DM is the ability to modulate one of the waveform generator's channels with either the internal modulation engine or an external source and then modulate the other channel with the first modulated channel. That explanation is a little confusing so lets use a diagram to clarify. The below figure shows a high level diagram of how the two channel waveform generators from Agilent's 33500B series performs DM (33510B, 33520B, 33522B, and the 33522A). 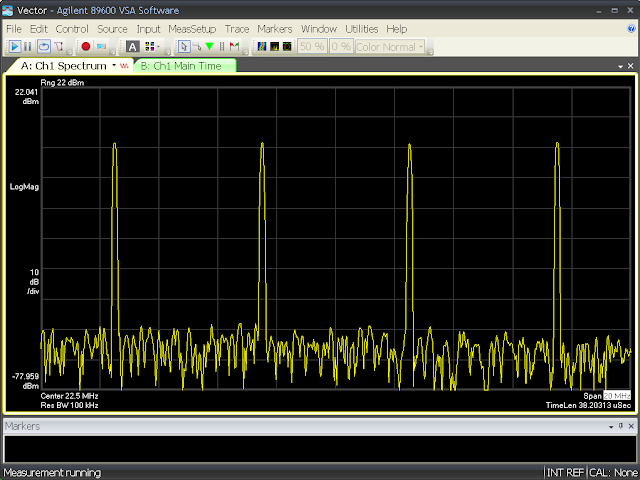 The above figure shows how two channel waveform generators from the 33500B series perform DM in their main FPGA. Notice that there are four independent waveform generation engines in the FPGA. Two waveform engines are used for channel 1 and 2. The other two less capable engines serve as an internal modulation sources for channel 1 and 2. In the figure channel 2 can be modulated by an external source or the channel 2 modulation waveform engine. From there channel 1 would be modulated using channel 2 as the modulation source, the resulting double modulated waveform will be outputted from channel 1. Let's look at two examples that takes advantage of using double modulation. In the first example we want to simulate a non-ideal 10 MHz clock signal by adding both random jitter and deterministic jitter in the form of duty-cycle dependent jitter. For the random jitter we want 75 ps of RMS jitter. For the duty-cycle dependent jitter we want a 10 KHz square wave. To build this non-ideal clock signal with double modulation using a 33522B waveform generator we first set the waveform on channel 2 for a 10 KHz squarewave, this is the deterministic jitter. We then modulate the channel 2 waveform with random noise using sum modulation (mathematically add the noise signal to the squarewave). We then set channel 1 to our 10 MHz clock signal and phase modulate it with channel 2 to add the jitter. To obtain the desired jitter magnitudes it is balance between adjusting the sum modulation magnitude on channel 2 and the phase magnitude adjust on channel 1. The example non-ideal clock signal was generated and the resulting random and deterministic jitter can be seen in the scope capture below. The figure shows a zoomed-in view of the clock signal's rising edge. The histogram's standard deviation represents the random jitter's RMS value which is 75.07 ps (click on figure to enlarge). The outlying edges that are about 1.5 ns from the ideal edge is the deterministic jitter from the 10 KHz squarewave. Note that if we refer back to the first figure of the FPGA, the example non-ideal clock signal is using three of the four waveform generators engines: main engine channel 1, main engine channel 2, and modulation engine channel 2. Let's look at another example where we create a four tone signal and use all four waveform engines to achieve TM. Our four tone signal will consist of tone frequencies 15 MHz, 20 MHz, 25 MHz, and 30 MHz. To build the four tone signal we set channel 1 to a 20 MHz sinewave and sum modulate it with a 15 MHz sinewave. For channel 2 the same steps were repeated except 30 MHz and 25 MHz frequencies were used. The Channel Combine feature on the 33522B was used to mathematically add channel 2 to channel 1. The resulting four tone signal can be seen in the figure below. Note that the TM abilities in a 2 channel waveform generator are not as capable as the DM capabilities since the channels can only be combined or summed together. This can be used for creating a four tone signal like we just saw or for summing an I and Q signal together. In this blog post we looked at how a two channel waveform can be used to do double modulation and even triple modulation. If you have any personal insights to add to this post use the comments section below. If you have any questions from the post feel free to email me. If we go back a couple decades’ the output level of an instrumentation power supply typically had to be set by turning the supply's analog knob and watching the display of your voltmeter connected to the supply's output to achieve an accurate voltage level. Today that is still true with low end power supplies, but mid range and high performance supplies can deliver an accurate user set voltage level that you can trust. 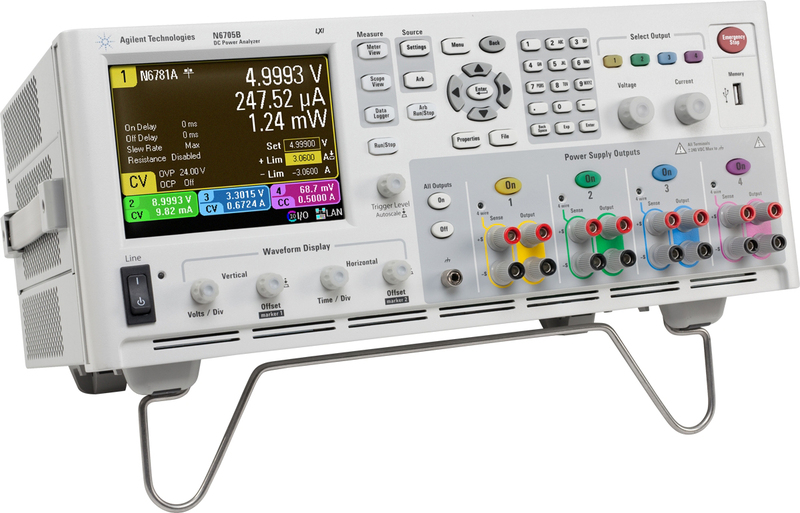 In this post we will take a look at power supply accuracy specs including how to determine a power supply’s voltage level accuracy as well as some other power supply accuracy calculations. Load Effect (Load Regulation): Voltage variations on the supply’s output level caused by changes to the load that the supply is connected to. The error here is caused by the supplies regulation circuitry not able to maintain the exact voltage level after a load change or change in current draw from the supply. Source Effect (Line Regulation): Error on the supply’s set voltage level caused by non-ideal input AC line power. Programming resolution: When setting a supply’s level, that level is turned into a digital value that is used by a digital to analog converter (DAC). The output of the DAC is used by the supply internally as a reference to set the correct output voltage level. In the digital to analog conversion process there is always quantization error and that is what the programming resolution represents. The higher resolution the DAC (more bits) the less error. Programming Accuracy: This is the key specification that encompasses includes the three just mentioned (load effect, source effect, and prog resolution) as well as parts tolerances such as amplifier drift. Programming Temperature Coefficient: If the power supply is not being operated in its ideal temperature range a temperature coefficient error value is added for every degree out of that range. The specs will typically be in the form of a static value (such as 4 mV), a percentage of the voltage range, a percentage of the programmed voltage level, or a combination of two of them. Let's walk through an example calculation using Agilent's N6761A Precision DC Power Module which is part of the N6700 family of modular power supplies. The N6761A is a high performance supply so it will have a high accuracy output level (low error tolerance). Below is a snapshot from the N6761A's data sheet showing the programming accuracy spec as well as other specs. That is pretty good accuracy for a power supply that is just slightly out of its ideal temperature range! One thing to note from this calculation is that we are assuming that we are looking at the power supply level over some averaged time period lets say 10 power line cycles or 166.7 ms. If we are looking at some instantaneous point on the voltage level of the power supply we can see higher error due to noise. The noise on a supply level is covered in the Output Ripple and Noise or PARD spec on the supply's data sheet. In the above data sheet figure we can see the N6761A has a PARD spec of 4.5 mVpp and 0.35 mVRMS. If we had a high resolution scope we could see the noise on the supply level. If we take an average measurement of the supply level the noise cancels out. When working with a supply that has built in measurement capability (like most supplies on the market today) remember that the measurement accuracy is separate from the programming accuracy. Also the measurement accuracy error spec may be worse or larger than the programming accuracy spec. As an example, below is a figure from Agilent's N6741B power supply data sheet. The voltage programming accuracy spec is circled in green and the voltage measurement accuracy is circled in red. As you can see the voltage measurement accuracy is worse than the voltage programming accuracy. In cases like this it is more accurate to use the programmed voltage level and not the measured voltage value. In the accuracy calculation we did it was assumed that the supply was being used in constant voltage mode (CV), where the supply regulates the output voltage at a set level and allows the current to fluctuate as the load changes (most common way to use a power supply). What if you are operating the supply in constant current mode (CC), where the supply regulates at a certain current level and the voltage is allowed to fluctuate with the load? The calculation is the same except you use the current specs versus the voltage specs. In this post we discussed what specs are used to make a power supply output level accuracy calculation. We then walked through an example calculation using Agilent's N6761A precision power module. We also compared measurement accuracy to programming accuracy. If you have any questions from this post feel free to email me and if you have anything to add use the comments section below. In this post we will take a look at a free MATLAB program called IQ Baseband Builder (IQBB) that is available for free download at MATLAB Central. IQBB program allows you to generate an ideal or non-ideal baseband IQ signal, analyze that signal using various plots, and then download the signal to either a CSV file or one of Agilent's new two channel waveform generators, the 33512B and 33522B. 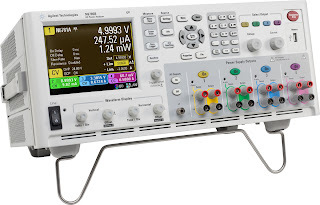 Back in August Agilent introduced a new family of waveform generators, the 33500B series (click here to view my post on the intro). The 33500B features a new exclusive waveform generation technology called Trueform which delivers the performance specs of a high end waveform generator, but at a much lower price point. For more on Trueform waveform generation technology check my post on it by clicking here. From the 33500B series of waveform generators, the 33522B and 33512B provide excellent solutions for generating baseband IQ signals since they provide two channels that can easily be synchronized. Let's take a look at an overview of the IQBB's features and capaiblities. Below you will find a screen shot of the IQBB GUI. Pulse shaping filters including raised cosine, root raised cosine, Gaussian, and rectangular. There are also settings for defining filter parameters such as beta and filter order. The ability to add white noise to the I and Q signals. Plots for analyzing the resulting signals including a constellation diagram, eye diagram, frequency domain plot, time domain plot, and filter response plot. Once the I and Q signals have been generated and analyzed they can be exported to a waveform generator (33512B and 33522B) or a CSV file. The IQBB program uses a LAN connection to export signal data remotely to either the 33512B or 33522B. Let's look at an example of the 33522B's signal quality using a IQ baseband signal created with the IQBB program. The signal was 64 QAM, 5 samples per symbol, and had a raised cosine impulse response. The resulting signal was captured with a wideband scope and analyzed with Agilent's 89600 Vector Signal Analysis software. A screen shot from the software is shown below. With Trueform technology the 33522B was able to deliver a 64 QAM baseband signal with only 0.3 % error vector magnitude! Notice too that the phase error is in milli-degrees and the magnitude error is in mV. In this post we look at a free MATLAB called IQ Baseband Builder that allows you to generate ideal or non-ideal IQ baseband signals. The program can connect remotely to an 33522B or 33512B waveform generators and export the software IQ signals so they can be generated in hardware. If you have any questions from this post send me an email and if you have anything to add use the comments section below. Designs ranging from transceiver chips for smart phones to radar assemblies for fighter jets require power supply noise immunity testing, which is often referred to as power supply rejection ratio (PSRR) testing. Characterizing the design’s ability to reject or attenuate supply noise is critical because the noise can manifest itself as bit errors in the case of transceiver chips and inaccurate target data in the case of radar assemblies. In this post, we will discuss the challenges involved in simulating power supply noise signals for PSRR testing and look at two economical methods for doing it. When you test PSRR, one challenge is modulating a quantitative noise signal onto a DC power supply level. This task is difficult because the power supply inputs typically present extremely low input impedance to any AC signal because of the high input parallel capacitance. While high-performance power supplies do have built-in arbitrary waveform capability, the output bandwidth of power supply waveforms is typically limited to less than 30 KHz. This limitation only allows you to simulate low frequency noise sources, such as power line ripple. It falls well short of the more critical noise source frequency ranges, such as power supply switching noise which ranges from 50 KHz to greater than 20 MHz. To put the first challenge in perspective, let’s consider an example transceiver chip for a smart phone. The power supply input most likely has a parallel 1-uF bypass ceramic capacitor as well as a large 10-uF electrolytic capacitor to serve as an energy reservoir for the sharp transmit transients. That means a 1-MHz sinewave modulated onto the power supply level of the RF power amplifier would, in theory, only see a load of less than 20 mOhms. In practice, the equivalent series resistance (ESR), equivalent series inductance (ESL), and other parasitic impedances boosts the load impedance up to more than 50 mOhms, but that still presents low input impedance to any AC signal content. Let's look at two solutions for simulating power supply noise that use (for the most part) general-purpose test equipment and simple components that you can find around the office or lab. The OMS solution can be seen in the below figure. The solution requires two power supplies, a function/arbitrary waveform generator (FG/AWG), an op amp, and a high-power N-type MOSFET. In Figure 1, C1, C2, and the resistance value labeled “Load” make up a circuit representation of the device under test’s power supply input. The OMS solution uses the MOSFET as a variable resistor between the power supply and the DUT (load). By varying the MOSFET’s drain to source resistance we can modulate the power supply's DC level with the desired noise signal. The op amp is used to maintain the desired voltage level at the DUT. With the op amp's inverting input connected to the same node as the input to the load, the op amp will drive the MOSFET's gate such that the amplitude level at its inverting input is the same as the amplitude at its non-inverting input. The FG/AWG’s output creates the amplitude level and noise signal at the DUT's input. The power supply output voltage should be set comfortably higher than the desired amplitude plus any added noise signal amplitude to ensure the MOSFET stays properly biased. This OMS circuit allows you to accurately generate noise signals with bandwidths up to about 500 KHz. The bandwidth can vary depending on the DUT's input impedance and how well the OMS circuit was constructed. For best results, keep wiring and leads as short as possible to prevent oscillations. As an example, the OMS circuit was implemented using an Agilent 33521A function/arbitrary waveform generator, N6762A power supply, E3630A dual-output power supply (to power the op amp), an IRFP150N N-type MOSFET, and an NE5534A op amp. The below scope capture shows the example OMS implementation generating a 200-mVpp 500-KHz sine wave onto a 5-VDC level. The same DUT load shown in the above diagram was used for this example, the 100-uF capacitor is electrolytic and the 1-uF capacitor is ceramic. When you implement the OMS, you will need to use a high-performance power supply because you need a supply with a fast transient response and a stable output to ensure the supply can handle the rapidly varying load levels caused by the noise signal. Also, in the OMS the DC level value is limited to the max voltage of the FG/AWG, which today is typically 10 V. To overcome this limitation, you could add a voltage amplifier between the op amp and the FG/AWG. The AMS does not have the voltage or bandwidth limitations that the OMS has, but it does have a higher price tag. The AMS is shown in the below figure. The AMS consists of a power supply, FG/AWG or signal generator, wide-band or RF power amp and coupling capacitor section. The FG/AWG and RF amp are used to modulate the DC level from the power supply with the desired noise signal. The coupling capacitor section blocks the DC level from the RF amp's input and provides a low-impedance path for the AC output of the power amp. The power amplifier is needed to boost the noise signal power to deal with the low impedance to AC that the DUT's input presents. You'll want to make the coupling capacitor section's impedance as low as possible, so you may want to use multiple capacitor values and types in parallel to reduce the effects of ESR and ESL. The exact circuit setup, the DUT's true input impedance, and the bandwidth of the noise signal will all determine how many watts the RF amp should be. A good place to start is 50 W, and you can go up from there. Note that the RF amp's output impedance should be as low as possible, which is typically going to be 50 ohms. With the DUT's impedance being so low, the RF amp will see a large amount of reflected power at its input, so when you choose an RF amplifier, be sure to select one that can handle a short-circuit condition. As an example, the AMS circuit was implemented using an Agilent 33521A function/arbitrary waveform generator, an N6762A power supply, an E&I 1040L RF power amplifier, and 10-uF and 0.1-uF capacitors in parallel (for the coupling capacitor section). A 1040L RF amp provided up to 400 W of output power, which was more than necessary, but I used what was available to me in the lab. Using the same load used in the OMS example, the AMS was used to create a single tone noise signal. 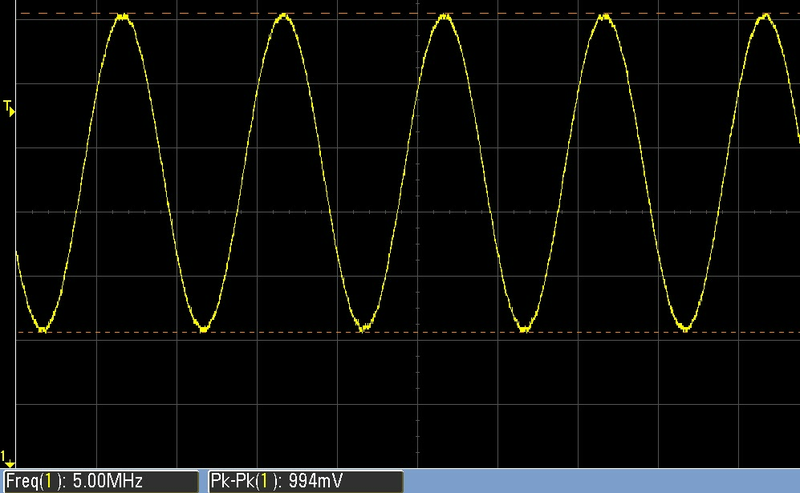 The below scope capture shows a 1-Vpp 5-MHz sinewave was modulated onto a 10-VDC level. Test and measurement power supplies typically have a high capacitance value at their output. In the AMS, the power supply is in parallel with the load in regards to the RF amp’s output. That means the noise signal actually has two low-impedance paths to take, the load and the power supply output. It is hard to know the power supply’s AC power handling characteristic across its input capacitance since it is not specified by the power supply manufacturer, so you may want to contact the manufacturer to avoid costly damage. One safety precaution you can take is adding blocking impedance between the power supply output and the coupling capacitor section. The blocking impedance can either be an inductor or a resistor. Its purpose is to protect the power supply from being damaged by the noise signal by adding higher series impedance before the power supply output. The inductor is ideal because it acts like a short to the DCV from the power supply, but presents high impedance to the AC noise signal. However, the inductor can cause large oscillations on the DC level if the DUT has a very dynamic current. Using a resistor avoids the oscillations problem. Be sure to use the power supply’s sense leads to regulate the output voltage at the load to compensate for the voltage drop across the resistor. Also be sure to use a low-value resistor no higher than 1 Ohm. This is to ensure a low voltage drop across the resistor so you do not damage the sense lead circuit on the power supply. PSRR testing is required on a wide range of devices today from smart phone chips to electronic assemblies for aircraft. Testing PSRR includes generating high-frequency noise signals on power supply levels. This task is challenging due to the high capacitance present at most power supply inputs. In this article we looked at two low-cost solutions for modulating noise signals on power supply levels. If you have any questions on the post send me an email and if you have anything to add use the "Comments" section below. 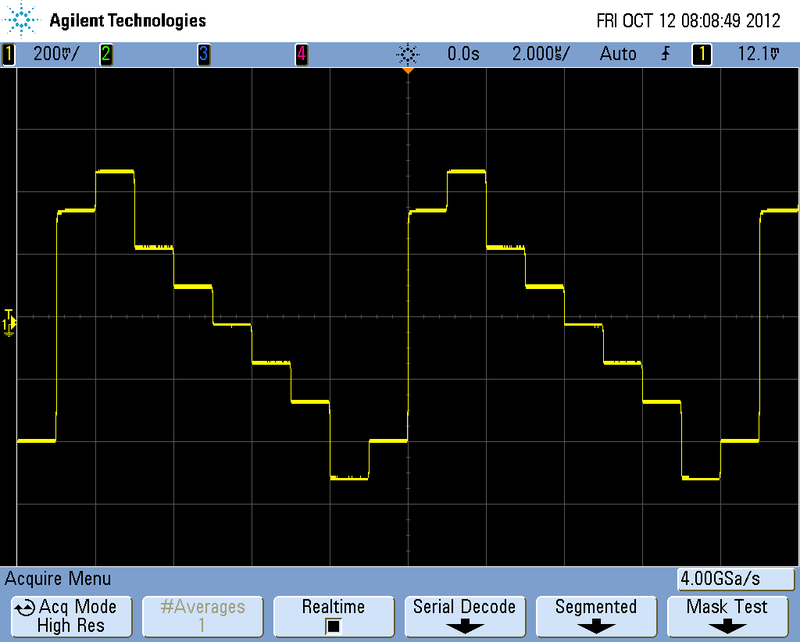 In this post we will take a look at Oscilloscope triggering. We will cover the basics and look at some of the advanced triggering capabilities found in modern digital scopes. Triggering is often the least understood but one the most important capabilities of a scope. You can think of oscilloscope triggering as “synchronized picture taking”. And one waveform picture actually consists of many individual and consecutive digitized samples. When monitoring a repetitive input signal the oscilloscope performs repetitive acquisitions (or repetitive picture taking) to show a “live” picture of your input signal. 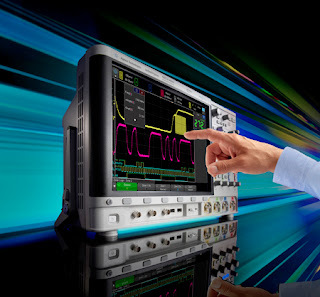 This repetitive picture taking of the oscilloscope must be synchronized to a unique point on the input signal in order to show a stable waveform on the scope’s display. Although some scopes have various advanced triggering modes to choose from, the most common type of triggering is to trigger the scope when the input signal crosses a particular voltage threshold level in either a positive or negative direction. We call this “edge triggering”. In other words, the scope triggers (takes pictures) when the input signal changes from a lower voltage level to a higher voltage level (rising edge trigger) or when the input signal changes from a higher voltage level to a lower voltage level (falling edge trigger). A photo finish of a horse race is analogous to oscilloscope triggering. To accurately record the finish of the race, the camera’s shutter must be synchronized to when the lead horse’s nose crosses the finish line in the forward direction. Let's look at two examples of oscilloscope edge triggering. In the screen-shot below, the scope’s trigger level is set above the waveform. In this case the input signal never crosses the trigger threshold level in any direction. The scope is taking asynchronous pictures of the input signal and we observe what appears to be an unstable waveform. This is actually an example of not triggering – or unsynchronized picture taking. In the below screen-shot, the scope is setup to trigger on rising edges of the input signal with the trigger level set at +2.01 V. In this case, we can see a rising edge of the input signal at exactly center-screen. Although the default trigger localization on all digital oscilloscopes is at center-screen (horizontally), you can re-position the trigger location to the left or right by adjusting the horizontal delay knob – sometimes called the horizontal position knob. Older technology analog scopes are only able to trigger at the left side of the screen. 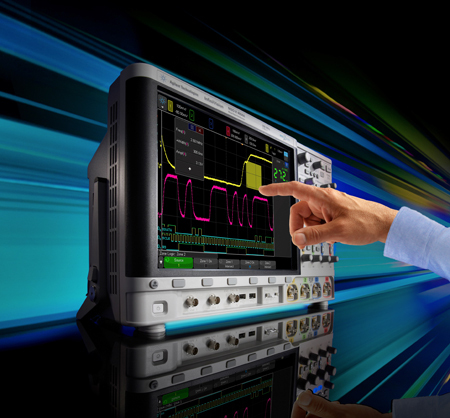 This means that analog oscilloscopes are only capable of showing portions of waveforms that occur after the trigger event – sometimes called “positive time data”. But DSOs are able to show portions of waveforms both before (negative time or pre-trigger data) and after (positive time data) the trigger event. Observing pre-trigger data can be useful for analyzing waveform data that may have led up to a specific error trigger condition. Edge triggering is by far the most common method used for scope triggering. Modern digital scopes also include many advanced triggering methods such as Pulse Width, Pattern, and Runt. Let's take a quick look at a few advanced triggering methods in modern scopes. The below screen shot is an example of signal parametric violation triggering. In this case we are showing an example of triggering on a rising edge that fails to meet a specified rise time of 100 ns. This scope can also trigger on falling edge violations, as well as edge speeds that are faster than a user-specified time. In the below screen-shot we showing an example of a setup & hold time violation. The scope has been setup to trigger on a rising edge of a clock signal (channel-1, yellow trace). The green trace shows the channel-2 waveform, which is a data signal represented as an eye-diagram. When writing data into a storage device, shift register, or latch, the data signal must be stable for a minimum amount of time before the arrival of the clock signal. This is called “setup time”. In addition, the data signal must remain stable (high or low) for a minimum specified time. This is known as “hold time”. In this particular example we can see that the data signal occasionally shifts in the positive time direction closer to the clock edge. We know that it is an occasional or infrequent timing shift as evidenced by the dimmer intensity of the trace (assuming that the scope has waveform intensity gradation capability). This is a violation of the device’s setup time. In this post we looked at oscilloscope triggering, from basic to advanced. If you have anything to add to this post use the "Comments" section below and if you have any questions send me an email. The following video gives a great overview of Agilent's new M9381A PXI Vector Signal Generator. The M9381A delivers Agilent quality and performance in the PXI form factor. The M9381A is blazing fast with 10 us switching speed, provides 160 MHz of RF modulation bandwidth, and better than +/- 0.4 dB amplitude accuracy. What is Trueform Waveform Generation Technology? Trueform waveform generation technology is an exclusive technology found in Agilent’s new 33500B Series waveform generators. Trueform technology provides sizable advantages over direct digital synthesis (DDS), the incumbent technology used in waveform generators. These advantages include significantly lower waveform jitter for less test uncertainty and a true representation of the selected waveform, not an approximation. In this blog post, we will look at Trueform and compare it to DDS. Conceptually, the simplest way to generate a waveform is to store its points in memory and then read those points out one after another and clock them into a DAC. After the last point has been read, the generator jumps back to the first point again to begin the next cycle. This is sometimes called “point per clock” (PPC) generation. Even though this method seems like the most intuitive way to create waveforms, it has two big drawbacks. First, to change the waveform’s frequency or sample rate, the clock frequency has to change, and making a good low-noise variable-frequency clock adds cost and complexity to the instrument. Second, since the stepwise output of the DAC is undesirable in most applications, complex analog filtering is needed to smooth the steps out. Because of its complexity and cost, this technology is used mainly in high-end waveform generators. DDS uses a fixed-frequency clock and a simpler filtering scheme, so it’s less expensive than the PPC method. In DDS, a phase accumulator adds an increment to its output in every clock cycle, and the accumulator’s output represents the phase of the waveform. The output frequency is proportional to the increment, so it’s easy to change frequency even though the clock frequency is fixed. The output of the accumulator is converted from phase data into amplitude data typically by passing it through some type of look-up table. The phase accumulator design allows DDS to use a fixed clock, but still execute waveforms at a perceived faster sample rate than the clock. So with DDS, not every individual point is being expressed in the resulting output waveform. In other words, DDS is not using every point in waveform memory, but it creates a really good approximation. But since it is an approximation, waveform data is changed in some way. DDS can skip and/or repeat aspects of the waveform in an unpredictable way. In best-case scenarios, this leads to added jitter; in worst-case scenarios, severe distortion can result. Small features in the waveform can be partly or completely skipped over. Agilent’s new Trueform technology represents the next leap in waveform generation technology. Trueform provides the best of both worlds. It gives you a predictable low-noise waveform with no skipped waveform points like PPC technology, but at the price point of DDS technology. Trueform works by employing a exclusive virtual variable clock with advanced filtering techniques that track the sample rate of the waveform. In the following sections, we will look at some of the waveform generation advantages Trueform provides over DDS. One of the key advantages Trueform provides over DDS is better overall signal quality. One of the best ways to show this is by doing a jitter measurement comparison with DDS. The following figures show a jitter measurement made on a 10-MHz pulse signal using a high-performance oscilloscope. The scope view is zoomed in on the rising edge of the pulse signal with the persistence setting of the scope turned on. The histogram function of the scope is used to measure the period jitter of the signals. The standard deviation measurement in each figure is circled in red and represents the signal’s RMS jitter. The Trueform pulse signal jitter measurement is shown in the below figure and the DDS pulse signal jitter measurement is shown in the next figure. In the above figures both the amplitude and time scales for the scope are the same. The Trueform pulse waveform has more than 10 times less jitter compared to the DDS pulse waveform. The substantially lower jitter that Trueform offers over DDS means less uncertainty in your tests. This is especially true when you consider edge-based timing applications like generating a clock signal, trigger signal or communication signal. As we mentioned earlier, DDS uses a fixed clock and a phase accumulator so it cannot guarantee that every point or feature in a waveform will be played. The higher the frequency, the more gaps you will see in the output waveform compared to the ideal waveform. Trueform, on the other hand, plays every waveform point regardless of the set frequency or sample rate. This becomes critical when you are dealing with a waveform that may have a small detail that is critical to the test you are performing. As an example, we created an arbitrary waveform that consisted of a pulse with seven descending amplitude spikes on top of the pulse. The waveform was then loaded into a Trueform waveform generator and a DDS waveform generator. First the waveform was played at a 50-KHz frequency on each generator. The result was captured on a scope, shown in the below figure. 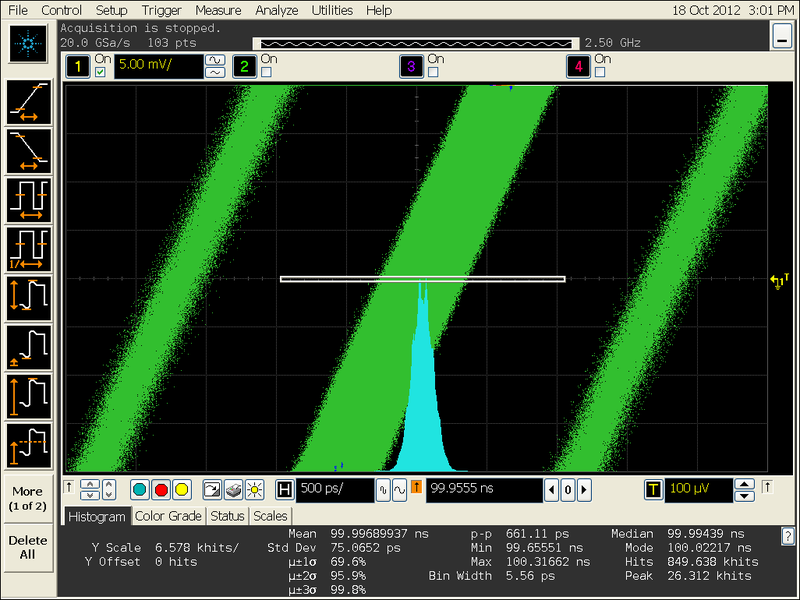 The yellow trace is the Trueform waveform and the green trace is the DDS waveform. At 50 KHz, each generator was able to reproduce the waveform with seven spikes on top of the pulse. You can see that the Trueform spikes reached higher amplitude. In the below figure scope screen shot, the waveforms were played again, but this time at 100 KHz. At 100 KHz, the Trueform waveform generator played all seven spikes and the DDS generator did not play any of the spikes. In the below figure scope screen shot, the waveforms were played again, but the frequency was doubled again to 200 KHz. At 200 KHz, once again, the Trueform waveform generator shows all seven spikes in the waveform. The DDS generator went from playing no spikes at 100 KHz to playing three spikes at 200 KHz. Notice that the three spikes played in the 200 KHz waveform do not match the correct time location of any of the seven spikes that are in the actual waveform points. These waveform examples demonstrate that when working with waveforms that have fine detail, DDS cannot be trusted. Agilent’s Trueform technology offers a new alternative that blends the best of DDS and PPC architectures, giving you the benefits of both without the limitations of either. Trueform technology uses an exclusive digital sampling technique that delivers unmatched performance at the same low price you are accustomed to with DDS.